The Ignis is all set to be the first launch for Maruti in 2017. 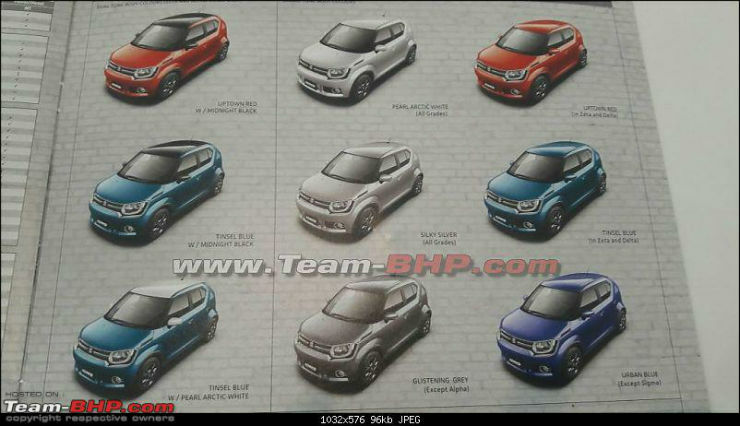 Maruti had invited us for a preview of the car a few days back and revealed all information about the car, however variant details and standard equipment across the range was not disclosed. Now though, the brochure of the Ignis has been leaked and we have all the information that you would need to know about the car, except the pricing that is. The Ignis will be launched on the 13th of January. It will be powered by a 1.2 liter petrol engine and a 1.3 liter diesel engine. Both engines will be mated to either a 5-speed manual gearbox or an AMT. Power outputs for the engines are not yet known, however we expect them to be similar to what is offered on the current Swift. There will be 4 variants on offer, Sigma, Delta, Zeta and Alpha. While the petrol will be available in all variants, the diesel version won’t be offered in the base Sigma trim. The AMT will be offered only on the middle level Delta and Zeta trims. On the safety front, Maruti will be offering dual airbags and ABS with EBD as standard across the range, a very good move in our opinion. Projector headlamps with LED DRLs will be on offer on the top of the line Alpha trim only. The top two variants, Zeta and Alpha will get alloy wheels where as the Delta variant will get full wheel cover. The touch screen infotainment system with Car Play system will only be on offer in the Alpha trim, where as the Delta and Zeta will come with a 2-DIN audio system. All variants, except the base will get bluetooth connectivity and steering mounted audio controls. The top end Alpha trim will get climate control where as the top two variants will get push-button start. Since the Ignis is a cool and funky offering from the company, it will be offered with a wide variety of colour options. White and silver can be had in all the variants. There is a grey, that will not be offered on the top of the line Alpha trim, while the Urban Blue will not be on offer on the base trim. Red and Tinsel blue will be offered on the Zeta and Delta variants where as the Zeta and Alpha can be had in dual tone colour options as well. The possibilities are Uptown Red with Midnight Black, Tinsel Blue with Midnight Black and Tinsel Blue with Pearl Artic White.